“It’s a well known fact that solar panels work more efficiently when they’re clean,” says SINTEF researcher and Project Manager Martin Bellmann who, in his day-to-day work, develops what is known as sustainable energy technology. “But what’s new here is that we’ve developed a robot to do the job. This means that the solar cells are cleaned both quickly and efficiently with as little as possible wear and tear or environmental impact,” he says. There really are all kinds of dirt. “The degree to which dust particles and contamination affects solar cells is very location-dependent,” explains Ryningen. “We’ve seen that some dust particles absorb light while others reflect it,” says Ryningen. “And small particles reflect more light than larger ones, whereas some scale contamination is biological and acts as a kind of ‘sun factor’,” she says. And some scale coatings are thicker than others. “Cleaning is part of standard operational procedures at our solar energy farms, where equipment is cleaned at least once or twice a year on order to avoid soiling. This involves the removal of everything from sand to bird droppings ,” she says. “But cleaning frequency is location-dependent. If a farm is located in a desert environment, the panels will require more frequent cleaning because the solar cells become covered with soil and sand,” says Sissener. “Cleaning robots may offer a relevant and attractive solution for solar energy parks located in areas where frequent cleaning is required,” says Sissener. “It is vitally important that we don’t discharge chemical pollutants into the environment,” explains Ryningen. “So we’ve rejected the use of traditional cleaning agents and have ended up using unbelievably small micro-droplets of water that are “sprayed” onto the glass, almost as a vapour. Then the robot uses a micro cleaning pad that effectively removes the contaminant particles. “It is vital that the robot doesn’t scratch the sensitive glass surface. Even small scratches can reduce the efficiency of the solar cells,” explains Ryningen, adding that “in theory, this should work on windows as well, which will open up a broader market for us,” she says. At large solar plants, keeping surfaces of solar panels free from dust and sand is not just a matter of good housekeeping but of whether or not the plants can really make a difference to the communities they want to serve. In other words, keeping the panels clean especially in very dry areas may be a matter of solar plant effectiveness or ineffectiveness. Solar plant panels in deserts collect large quantities of dust. Recently, a solar park in Israel was provided with an answer to the problem. 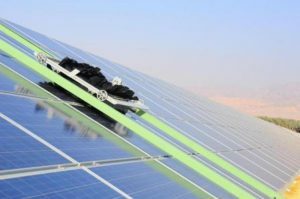 The 20-acre Ketura Sun Solar Park in the Negev Desert (located in the hot southern stretch, which suffers from sandstorms and little rain) was introduced to a robotic cleaning process from an Israel-based company, Ecoppia. No water is needed for the cleanups. Instead, each night (cleaning typically takes place during the early hours of dark) 100 centrally controlled E4 robots, as they are called, go to work on the panels using microfibers and controlled air flow to push dirt off panels. The robots use gravitation to move the dust particles downwards and off the panels. They move along a rigid aluminum frame with wheels coated with polyurethane; there is no load on the solar panels’ surface. Ecoppia designed the system to be water-free and energy-efficient. When not cleaning, the robots are locked to a docking station outside of the solar PV row. While docking, robot batteries are charged through their solar panel. The fleet can be remotely managed from a dashboard or mobile app. Before the latest robotic cleaning process, Ketura Sun’s solar panels were only cleaned about nine times a year, in consideration of the expense involved in a labor-intensive, water-based cleaning process. Manual panel cleaning could take up to five days. As a result operations worked suboptimally and in the interim between cleaning cycles the park suffered electricity production degradation due to “soiling,” the term used to describe the accumulation of dirt and dust on photovoltaic solar panel surfaces. Ecoppia, founded in 2013, is in the business of photovoltaic solar panel cleaning solutions The Ketura Sun solar park is jointly owned by Siemens AG and solar energy pioneer Arava Power. Founded in 2006, Arava Power has seven solar parks in production or development across the Negev, with a total production capacity of 80 MW. In 2009, Siemens AG acquired a 40 percent stake in Arava Power. The park’s robot cleaning crew is yet another marker of interest by the solar industry in improved techniques for keeping panels clean and efficient. Last November, a Tokyo-based company, Sinfonia Technology, announced it developed a robot with camera and sensors that can move autonomously and clean solar panels at large-scale solar power plants. Its robot had another approach, with equipment including scrub brush, wiper and detergent; and sprinkling water stored in its tank. Also in November, US-based SunPower announced the acquisition of Greenbotics, a company with panel cleaning products for large-scale solar power plants.